The Hudson Valley Community College Foundation hosted its annual Gala on Friday, Oct. 12 at the Franklin Plaza ballroom in Troy. 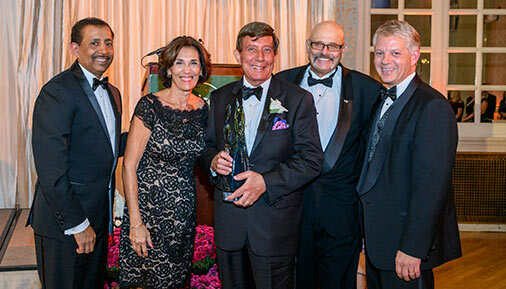 This year's event was dedicated to honoring the achievements of Albany Medical Center President and CEO James Barba for his leadership in the region’s health-care industry and many philanthropic contributions to the college. At the event, Barba was honored with the Foundation's Leadership Award for service and dedication to the college and greater community. Albany Medical Center has been a very generous supporter of Hudson Valley throughout the years. In 2009, Albany Medical Center established a monumental $1.75 million agreement to provide ten years’ worth of funding and support for the college’s Nursing program. This milestone gift provided the college with new equipment for nursing labs; support for faculty salaries and benefits; and funds for special educational programming for students. It also helped the college to remain one of the premier nurse training institutions in the Northeast and to provide the highest quality nurses to hospitals and healthcare organizations throughout the region and the state. The organization has also established the Albany Medical Center Scholarship Fund for the Respiratory Therapy, Radiologic Technology, and Nursing programs while also donating equipment to the college’s Surgical Technology program. In addition, the Center holds a longtime partnership with the college’s Department of Cardiorespiratory and Emergency Medicine to bolster the region’s healthcare education. Barba’s leadership has been instrumental to these initiatives. Barba also served as honorary chair for the Foundation’s first major gifts campaign – the most ambitious fundraising effort in the college’s history. The campaign, entitled The Promise of Our Region: The Campaign for the Community, raised more than $10 million to support the college, including leadership gifts from Albany Medical Center. All Gala proceeds will benefit the college’s School of Health Sciences, which houses 15 degree and certificate programs including nursing, dental hygiene and assisting, EMT-paramedic training, mortuary science , diagnostic cardiac and medical sonography, polysomnography, radiologic technology, respiratory care and surgical technology. The School of Health Sciences enrolls more than 700 students each year and is widely respected by the Capital Region’s employers in the medical field for the quality of its programs and success of its graduates. Funds raised at the Gala will go toward scholarship initiatives, programming, supplies, instruction, facilities and more. Capital District Physicians’ Health Plan Inc.